Josenhans Newsletter ~ Ocean Fish!! I hope to get current with these reports today as it looks like I’ll be back to fishing tomorrow for a good stretch. The winds are finally forecast to let up enough to poke the nose of the Jones Brothers out into the bay. Fishing really started to heat up in the shallows last Saturday when Ralph Bones and friend Keith joined me for a day on the water. 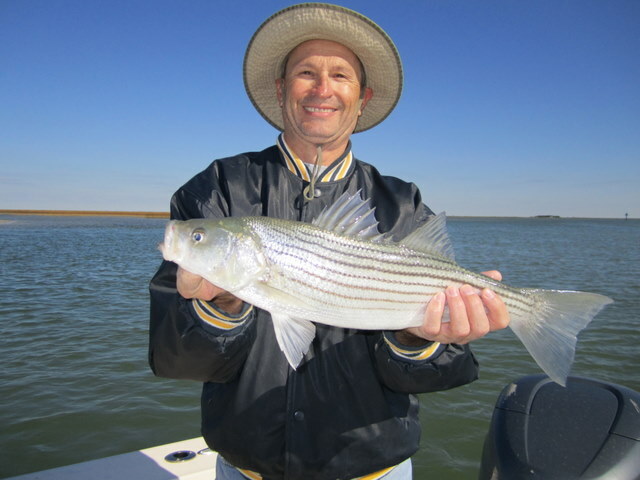 We hit a couple of creeks around Smith Island and while only one really produced, it provided some no-stop action on mostly 20″ – 23″ rockfish for about an hour. That’s the way the fall has been with the creek fishing. On any given day it has been only one or two creeks that pay off. Good fishing when you find the fish, but deep down it tells me there are less rockfish in the system. I hope the ASMFC doesn’t increase the commercial limit for striped bass like they’re talking about. After the creek gave up all it was going to, we traveled south to Tangier Island and had some fast action on nice sized stripers during the ebb tide. Again, many of the fish were in the 20″ to 23 inch size range – the last respectable year class. Hard fighting and healthy. Sorry no pics, the guys were having too much fun. Jack McHale and Ted Campbell joined me for a full day this past Monday and we were greeted by a strong northerly breeze and a rising tide. At least the book said the tide was rising. After a couple of hours of fruitless casting the creeks, I decided to head to a great flood tide spot on the western bank of Smith Island. Thinking I was just about at the peak of the tide, and not paying near as much attention to the level of water on the banks as I should have been, yes, you guessed it, I proceeded to run the JB up on a mud bank. No harm-no foul, I’ll just get out and push the boat off and we’ll be on our way. Didn’t work out quite as planned, and to make a long (could have been very long) story short, the guys volunteered to jump over in the 51 degree calf-deep water and help push the boat off the bar. I think the alternative of waiting ten hours for the tide to return gave them a little extra incentive. Thanks again Jack and Ted for bailing me out. After pretty much only getting our legs wet we dried off and continued the days fishing. After a slow morning with only a few creek fish, the wind let up enough to travel to the main bay, where acres of rockfish were chasing bay anchovies on the surface. The guys had a blast for several hours as we chased school after school of hungry stripers. A nice way to end the day after a slow (cold) start. 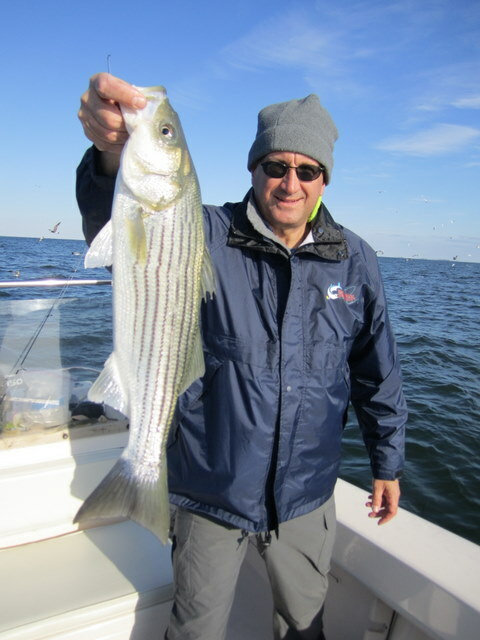 On Wednesday, I had the pleasure of taking fishing a diehard rockfish fan in Werner Gruber. Werner loves to eat rockfish and our goal was to get him a couple for the table. We traveled back to the main bay from Crisfield with a moderate east wind at our backs. Not a bird was sighted until we approached Holland Light, at which time we observed a thick mass of gulls, terns and gannets diving in about twenty eight feet of water. 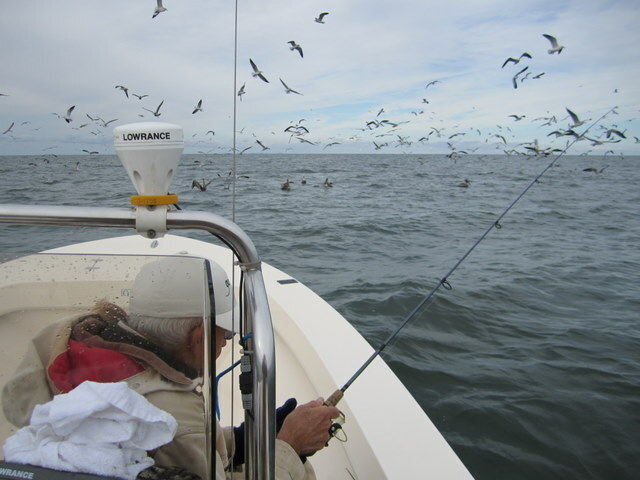 I told Werner that many times the gannets mean there are big fish close by, and sure enough the second tug on our Bass Assassins provided stiff resistance and a drag-screaming run. 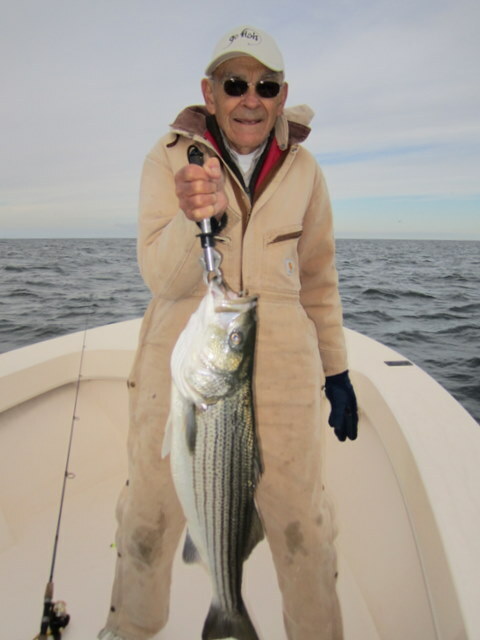 Werner fought the fish like a pro and soon boated a fat 32″ rockfish that tipped the boga at twelve pounds. Werner likes the smaller fish for the pan so the twelve pound rockfish was released alive. For the remainder of the day we had non-stop action with a nice grade of stripers in the 20 to 24 inch class. Werner got his dinner and was a happy man on the long ride back to Crisfield. The fish are there for the taking so long as the wind will allow us to go and get them. Hoping for an Indian summer real soon.